"The One With The Zesty Guy"???? It started as any other day begins for me — doing a deep dive on Friends on the internet. Normal work stuff. Anyway, I started to notice that some of the episodes had two different titles listed. Apparently, there are five episodes that are like that and I've lived my whole life in the dark. Now listen, all of my high school and college professors told me not to use Wikipedia or Wiki pages as a source, so I tried my best to find alternative proof about this on the internet. But PLEASE feel free to comment with any additional information you might have — I'm curious if there are regional differences that I'm not aware of or if anyone else has any ~insights~. 1. "The Pilot" (Season 1, Episode 1). 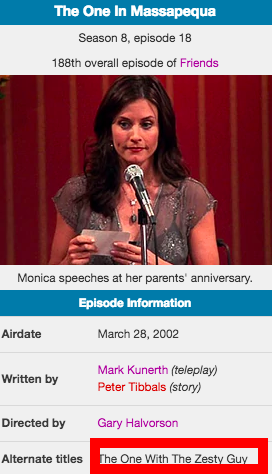 This is the very first episode (doi) and apparently is also called "The One Where It All Began" AND "The One Where Monica Gets A Roommate". 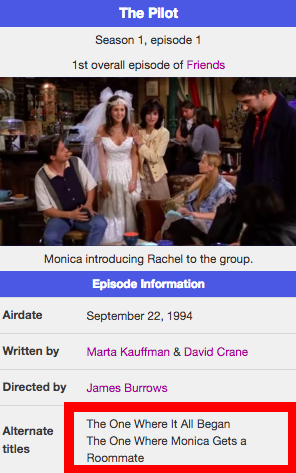 TBH, I'd heard "The One Where Monica Gets a Roommate" before, but not that other one! What did you think this episode was called? "The One Where It All Began"
2. "The One Hundredth" (Season 5, Episode 3). 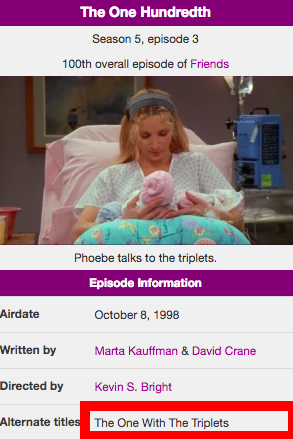 This is the episode where Phoebe gives birth to Frank Jr. Jr.'s triplets — and apparently it's also known as "The One With the Triplets". "The One With The Triplets"
3. 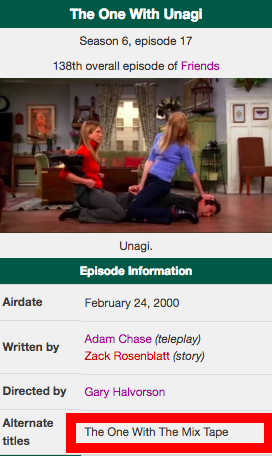 "The One With Unagi" (Season 6, Episode 17). 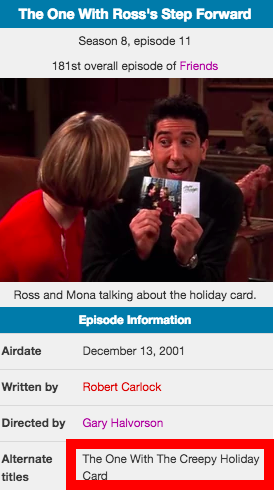 This is the episode where Ross teaches Rachel and Phoebe about UNAGI and Chandler gives Monica a mix tape for Valentine's Day — it's also known as "The One With The Mix Tape". "The One With The Mix Tape"
4. "The One With Ross's Step Forward" (Season 8, Episode 11). 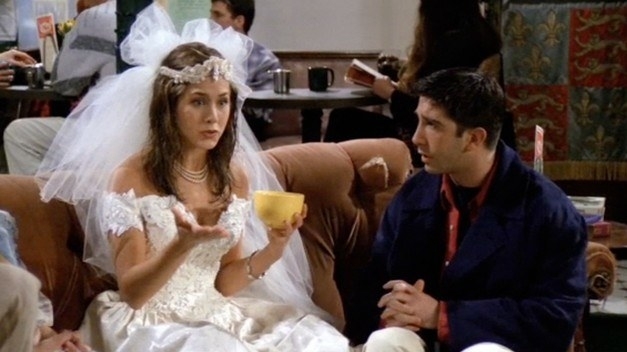 This is the episode where Mona wants things to progress quickly with Ross. It's also known as "The One With The Creepy Holiday Card". "The One With The Creepy Holiday Card"
5. "The One In Massepequa" (Season 8, Episode 18). 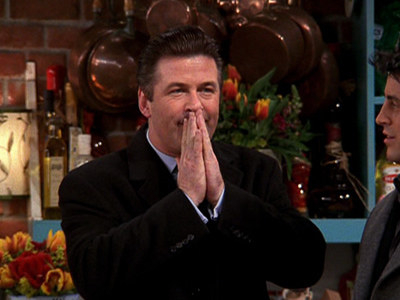 This is the one with Phoebe's annoying boyfriend, Parker (played by Alec Baldwin) and apparently it's also called "The One With The Zesty Guy". I mean, it sounds like a zesty title!!! "The One With The Zesty Guy"
Thanks for joining me on this ~journey~! I hope you learned something new.